After downloading the older version of Synergy, you can configure it like you used to as far as screens. The next thing was figuring out where to edit the Synergy config. 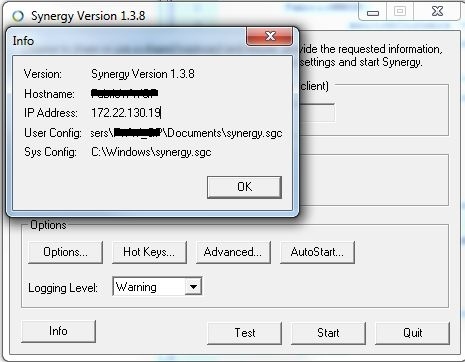 At the start screen you can click the “Info” button, and this will show you the path to your local Synergy config file. Next you can edit that file and add the following to the “screens” section, for me I wanted to map my Windows keyboard to be the same placement as my Mac – so Alt = Command, and Windows = Alt/Option. When using terminal I like control to still be control, either platform, this is why I don’t touch it. On the Mac side it never seems to work resolving the Windows hostname – and instead I have to use the IP address. Which is where the above script, and this one below help bridge the gap. For my OSX script I just needed to install Samba so I could use nmblookup. Happy Mac-ing from your Windows PC!